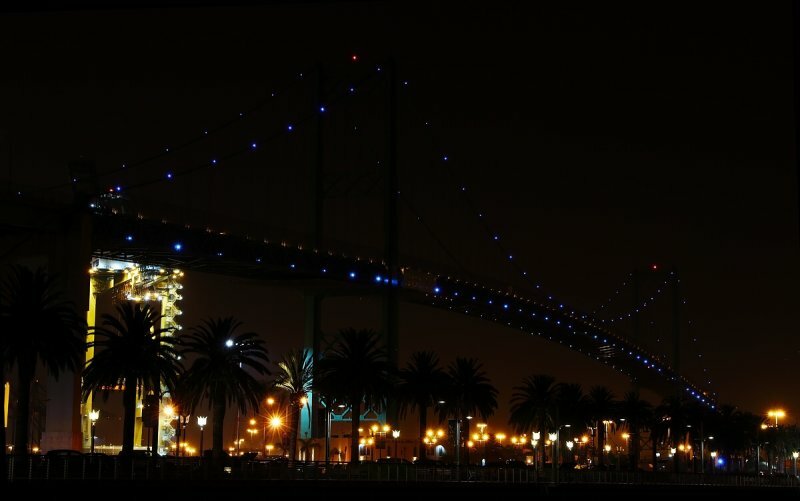 The Vincent Thomas Bridge is a 1,500-foot-long (460 m) suspension bridge, crossing the Los Angeles Harbor in the U.S. state of California, linking San Pedro, Los Angeles, with Terminal Island. The bridge is part of State Route 47, which is also known as the Seaside Freeway. The bridge opened in 1963 and is named for California Assemblyman Vincent Thomas of San Pedro, who championed its construction. It was the first welded suspension bridge in the United States and is now the fourth-longest suspension bridge in California and the 76th-longest span in the world. The clear height of the navigation channel is approximately 185 feet (56 m); it is the only suspension bridge in the world supported entirely on piles. My favorite of the three. The bridge really stands out here.